Our lawn care programs consist of scheduled applications of fertilizer and weed control. 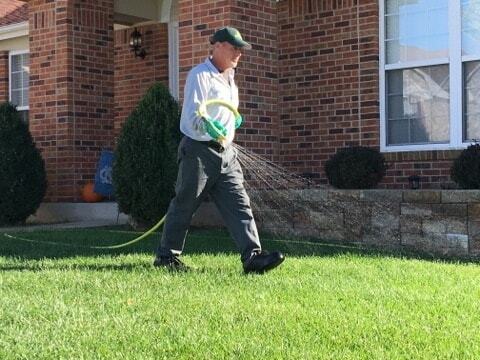 These treatments result in a healthier, lush, green, great looking lawn. Local soil conditions do not have enough nutrients to do this alone. We provide 7 lawn care applications with balanced blends of fertilizer. We start the year with two pre-emergent barrier applications to control crabgrass. Each lawn care application includes the use of a herbicide to control broadleaf and grassy weeds, like nutsedge. A successful lawn care program requires both technical knowledge and turf management experience. Grub damage is the most common type of damage sustained in lawns throughout the United States. Customers who choose to add grub control to their scheduled services will receive it along with control of all turf feeding and subsurface feeding insects.